Nowadays when the summer or winter Olympics come around, knitters around the US (at least) put on their own version of self-imposed competition: the Knitting Olympics. The rules are simple: Before the real Olympics, you choose a project to knit during the games and then let a local yarn shop or web site hosting KO know what your project is. Or, just buy your yarn, then sit back and wait for the games to begin. You cast on when the opening ceremonies begin, and finish the project by the end of the closing ceremonies. This is about finishing your proposed project, not about who finishes first. Plus, it is suggested that each project offer the knitter some challenge in the form of a new technique or unusual spin on something familiar. Training? Sure, knitters can train (practice) techniques beforehand, as long as they wait to cast on the actual project when open ceremonies begin. In honor of the 2010 Olympics being in Vancouver (and a lot of growing eagerness on my part for a couple of months), I chose a Cowichan (pronounced koh-WEE-kun) cardigan sweater as my KO project. The Cowichan Band (tribe) is native to Vancouver, so this project made a lot of sense in light of the Olympics taking place there that year. (For more information, including some of the controversies surrounding their traditions, click here.) However, unlike knitters in the Cowichan Band who knit in images relating to their culture (many designs come from their weaving and basketry), I based my sweater on the theme of Yellowstone National Park, specifically the Old Faithful Inn, at whose front desk I worked for the 2000 summer season (5 1/2 months and 170 miles hiked in the wilderness). Project decided, I joined up with The Lamb Shoppe in Denver’s Congress Park neighborhood, one of many shops around the country hosting KO. My only concern: I am going to knit this in 17 days??? Click here to view progress. Clockwise from lower left: Knitting in the Old Way by Priscilla Gibson-Roberts (this is my “bible,” which includes a sizeable section on Cowichan sweater techniques), a “training” sample on which I practiced gauge, plackets and shawl-collar shaping, 40″ circular needle in US size 10.5, balls of yarn and a skein yet to be wound (in all, eight skeins were used), the folded piece of paper is a “cartoon” that helped me visualize sweater details like numbers of stitches, yet another circular needle, a book about the Old Faithful Inn (its photos provided useful memory jogs towards planning and charting images to go on the sweater), another training sample on which I practiced knitting in reverse, a “tool box” loaded with stitch markers and yarn needles. Not shown: a photo from a geyser gazer of a fireplace grate at the Old Faithful Inn and a lot of knitting graph paper! choosing and charting the graphic images that would go all over the sweater. 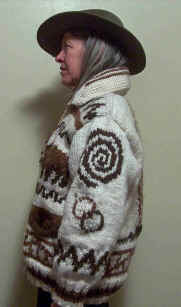 Note: The Cowichan sweater is traditionally knitted in one piece. No seams, no sewing. This is my kind of knitting! Let the Knitting Olympics Begin! Here is the condensed story of my progress (which is still pretty long). I took at least one photo at the end of every day (only some of them appear here), and kept a brief journal describing what was accomplished. Just above the hip band are railings found along the Old Faithful Inn’s balconies. The dark brown columns on either side of the growing Old Faithful Geyser represent the log-cabin-style columns on the outside front of the Inn. The columns are finished, as the sweater has reached the underarm. Now fronts and back need to be divided to shape the armholes. The bottom of edge of Old Faithful Geyser’s earth mound represents our wedding date “in code”. Can you figure out what the date is? The step borders above both pockets represent change of life. (2000 was a big life-change year.) Note that holes for both front pockets are in place. Day 14 (Thursday before closing ceremonies): Progress is lagging. I cast aside that part of my day job devoted to book writing and went to Lamb Shoppe for both a change of scenery and to knit like billy-o. On this day, an OFI monogram of my own devise was completed on the first sleeve, plus a wolf howling at the “moon.” For more about this knitting session, click here. The pink stitch holder hanging from the back of the neck holds live stitches of a collar stand that will elevate the shawl collar off the top edge of the sweater back once it’s made. Also notice the nifty shoulder seam, a traditional treatment for this sweater. At this point, I have two time problems: I have to be at church-choir rehearsal tonight to teach a Palm Sunday anthem I composed, and I am going to the mountains for Day 15 and 16 to do a little snowmobiling and topped off by a mountain-summit fondue dinner. There will be time to knit, but how much? At 3:30pm on Sunday, Feb. 28 (Day 17, with closing ceremonies this evening), the second sleeve is more than halfway finished. Obviously I made some progress, but not quite enough. The image below the doorbell states the year I worked in Yellowstone, designed to also look like interlocking wedding rings. After church, the next stop was home and back to the needles. I finished the second sleeve at 7pm, and then my husband and I headed for The Lamb Shoppe to display my progress and watch the closing ceremonies on TV there. And then it would take seven more hours to darn in all the ends. This mass of fiber is part of the 27g that used to be trimmed ends. Here are the medium-brown ends restored to fiber, using wool combs. I then spun a couple grams of the medium-brown fiber into a thin, 2-ply yarn with which to sew on antler buttons purchased from Idaho Antler Art. The US quarter in the photo at right gives you an idea of how thin this yarn came out. Knitters are always curious about what the inside of a project looks like. 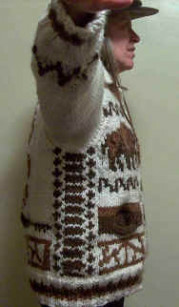 Here is the sweater body, with the ends of one front darned in and the ends of the other front yet to be finished. There were just as many ends on the cleaned-up front, with (thankfully) a lot fewer on the back and sleeves. Now you can understand why it took seven hours to darn in the ends! Notice that the pockets are in place. These were attached by knitting them in, not by sewing. I made each pocket white in order to see more easily any items that might be inside. Unanticipated knitting challenges that cropped up along the journey: Revising Bulgarian intarsia. This method is used for knitting in the round, and is applied best when the pattern and background yarns work their way across the pattern area pretty much equally. However, I found a way to knit as many consecutive stitches in one color as I want without producing a long float of yarn on the wrong side. (Bulgarian intarsia isn’t supposed to work this way!) Take a look at both sides of the wolf on the right sleeve below. 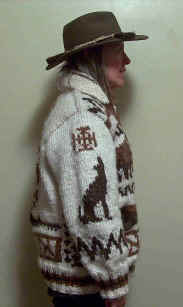 The right side of the knitted fabric shows row after row of dark brown stitches depicting the wolf. Flip the image over to the wrong side and now see the short white floats of Bulgarian intarsia, not long white floats that come from “regular” intarsia. How to really hide darned in ends. (Wow, I found some great ways to do this!) Spinning matching sewing yarn for buttons with yarn remains. So, I really had 10 challenges in all! The Lamb Shoppe offered a 20% refund on yarn purchases for all KO projects completed by a couple days after the real Olympics were over. Because the knitting was finished (but not the darned-in ends–darn!) that day, I was able to hustle over to Lamb Shoppe on the final evening to receive a refund of $26.07. That helped! (After all, we knit to create heirlooms, not necessarily to save money. This project is definitely one of a kind.) Thanks, Lamb Shoppe! The sweater was completely finished ca. 7:45pm on Wednesday, March 3. I may not have crossed the finish line on time, but at least I crossed it! This sweater–er, coat really–is heavy, weighing in at 3.75 pounds! It’s warm, it blocks the wind, and it fits! Denver’s temps upon completion were in the upper 50s the rest of the week! Has this sweater been to Yellowstone? You bet! I wore it everywhere we went in the Park. All of the employees noticed it right away; none of the visitors caught on. Go figure. OK, so the bison are strategically placed on the front…. Notice the stripes on the collar, too. 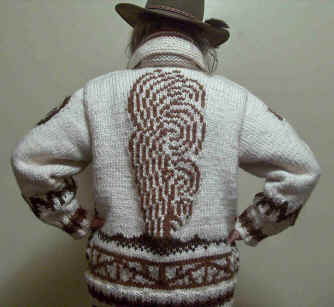 The back, with Old Faithful in all its knitted glory. The doorbell and year insignia; collar stripes are quite visible here. Lift either arm, and you find a log-cabin column! Antler buttons make the perfect touch! I learned a lot from knitting this sweater, and am glad for all the new skills. I feel like I can conquer anything with my needles now. Some techniques on this sweater I would execute differently next time (um, next time?–yikes! ), but the fact that I can knit a sweater at all, without a pattern and without sewing (I drafted the pattern as I went), still amazes me, and this one came out more than respectably, I think. (Thanks to Priscilla Gibson-Roberts and her editor Deborah Robson for Knitting in the Old Way, the book that gave me the courage and backbone to attempt this project–in a traditional manner, no less. 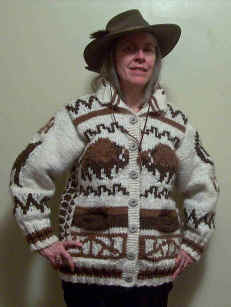 By the way, a new edition of Priscilla’s Salish Indian Sweaters is to be released by Nomad Press soon. Would I participate in a Knitting Olympics again? When my work load is lighter, perhaps.